Dan Greenblatt, who blogs about design and user experience at Focus + Context, wrote a great post and created a Flickr stream about I-GO from a user experience standpoint, pointing out the success of a “Frankenstein solution” that mixes high-tech, low-tech, and honor system methods to make sharing cars easy and hassle-free. That is interesting. A lot of folks, especially in areas where daily driving is necessary, grew up thinking of their car almost as an extension of their body – sharing one would be pretty weird. This is different – an I-GO car is “someone else’s car,” but it is also yours! It’s easy to use (as I hope I’ve shown), it’s affordable, and though it sounds kind of twisted, not driving very often actually makes it quite fun (especially if you’re driving a Prius). I know, dude – it feels like a special trip when driving now, especially when it’s a Prius, with all the Star Trek-looking display systems and everything. Funny as it may seem, you’ll never have more fun driving than when you go carless. You heard it from Dan – his post is a good one to forward to skeptical friends and family in the city who may be reluctant to join the car sharing movement – they’ll find much fun and convenience to be had if they do. Part of I-GO’s mission is to get cars off the street and reduce urban congestion. But if you made it out to the 31st annual Chicago Marathon this past Sunday, you might have caught a glimpse of I-GO’s very own Sheena McNeal taking that ideal one step further. Or, rather, thousands of steps further. People power is about as low-emission as it gets. Sheena has been our Outreach Coordinator for the past two years. 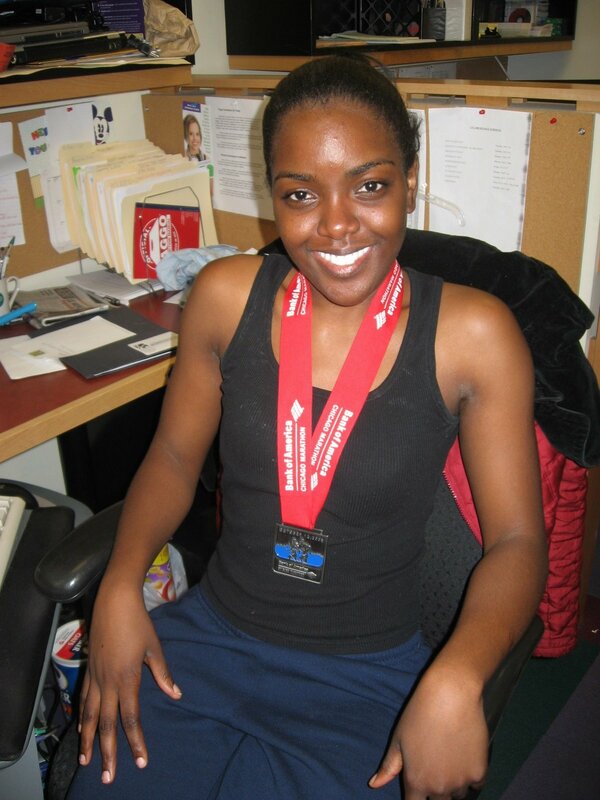 This was her first marathon; although, judging from the glow on her face afterward, it won’t be her last. Congratulations to Sheena and all the other runners who participated and epitomize the most environmentally friendly mode of transportation of all. If you find yourself near a TV tonight at 9pm, be sure to check out the Fox News segment on I-GO Car Sharing. As an I-GO Car Sharing member, you probably aren’t too worried about how the rising gas costs will alter your budget. However, these rising prices do have many Americans worried. Check out this recent Chicagoist article on how the rising cost of fuel is fueling the growth of car sharing in Chicago. 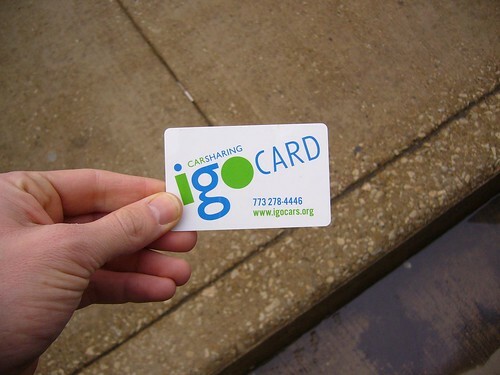 NBC Channel 5’s Ginger Zee Joins I-GO Car Sharing! Don’t worry if you missed Ginger’s report “Going Green” on May 29th about I-GO Car Sharing, we’ve got the video that shows how this busy reporter survived giving up her car for one week. Click here to watch Ginger Zee’s report. While working at I-GO Car Sharing I have had the pleasure of meeting a lot of our members- and let me tell you, we’ve got some interesting, involved and inspiring members! So, I have decided to interview a different I-GO member each month and post what I learn here, for all to enjoy. Last week I interviewed I-GO member Jessa Brinkmeyer. 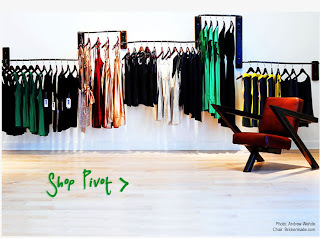 Jessa started, runs and owns Pivot, Chicago’s 1st boutique devoted to eco-fashion. Last week we chatted by phone about her life at Pivot and how I-GO Car Sharing helps her get everything done. When I asked Jessa why she opened Pivot and what she wanted to accomplish through the eco-boutique, she spoke of her desire to show people that they can have more conscious wardrobes without sacrificing fashion, style, personal taste or comfort. Before opening Pivot, Jessa worked as a journalist at a small magazine in Chicago. She was primarily responsible for covering the fashion industry and soon became fascinated with the fast-growing, eco-friendly segment of the industry. Jessa wanted not only to wear the eco-friendly fabrics and support the sustainable designers herself, but also to spread the word. She was disappointed when she was unable to find anything like this in Chicago. After visiting eco-boutiques in New York City, Jessa realized that the best way to promote her passion was not through her writing but by opening the first ever eco-boutique in Chicago. These days it seems like everyone is “going green” and it can be hard to tell who not only talks the talk but also walks the walk. Pivot definitely walks the green walk! All of the designers use sustainable and organic materials and low impact, eco-friendly dyes. All of Pivot’s fixtures were designed and built by local artist, Joshua Height, out of recycled materials. Indoor air quality at Pivot is improved by using zero-VOC (volatile organic compound) paint and they also use CFL lightbulbs. In an effort to give back to the Chicago community, Pivot donates 1% of its profits to Growing Home, a local organization that provides job training and employment opportunities within the context of a non-profit organic agriculture business. Jessa’s environmental awareness was also what led her to car sharing in Chicago. She specifically likes I-GO Car Sharing because we’re a non-profit and use only hybrids and low-emission vehicles. Jessa uses I-GO to take her recycling to a sorting center and to take old light bulbs and batteries to a hazardous waste center. She also uses I-GO for grocery trips and for checking out urban farm sites and events for Growing Home. Jessa sees I-GO as a great way to get things done a little more efficiently without having the burden of car ownership or contributing to the greenhouse gas problem. To learn more about Pivot, check out their website, or swing by the store. Pivot is located at 1101 W Fulton Market. Let it snow, let it snow, let it snow…. Or not? Remember when you were little- think elementary, middle school age. You there yet? It might help to close your eyes for this little exercise. So now your eyes are closed (well, obviously not since you’re still reading this- but you get the idea), you’re picturing yourself in your pre-teen years, it’s a cold February morning and you wake up to snow, ice, sleet and wind- you’re ecstatic, you love these days, you check the local news- school is cancelled! Yes! “Let it snow, let it snow, let it snow” you hum to yourself as you retreat to your warm bed. Flash forward to the present. No longer does such a morning put a smile on your face. In the present day of jobs that don’t recognize the beauty of snow days and the commute that often goes hand in hand with such jobs, the snow days we all once loved are now cause for foul language and frustration. While dreaming of sunnier days and changing your computer’s screen-saver to a serene beach scene can help ease the pain, so too can a good venting session! So we want you to share your craziest Chicago weather experience with us! Whoever’s story makes us laugh the hardest and cringe the most will receive $10 in driving credit. Ready, set, vent! You are currently browsing the archives for the i-go stories category.